Mort Künstler Hand Signed and Numbered Limited Edition Canvas Giclee:"Washington's Crossing"
Edition Size: Artist Signed and Numbered with COA to 197 total editions. COA included. Medium: Fine Art Giclee on Canvas Editions. Image Dimensions: 16" x 24" , 21" x 32", 27" x 41" and 35" x 53". About the Art: During the summer and fall of 1776, the Continentals had fallen back from New York and across New Jersey. Washington's army slowly disintegrated as soldiers deserted or went home at the expiration of their enlistment. Only a few thousand ragged and exhausted soldiers remained. Washington nearly despaired of victory and even considered resignation. At this low ebb, the moment demanded someone who could articulate the patriots' anguish and yet keep them focused on the cause and victory. This man was philosopher and revolutionary, Thomas Paine. Buoyed by words like these, the soldiers supported Washington. To make use of his dwindling army quickly, Washington determined to launch a surprise attack on the enemy garrison at Trenton, which consisted of about 1,500 German soldiers in a brigade of three regiments. For many days, the Americans had been harassing the Germans in a series of pinprick raids, driving them to exhaustion by keeping them constantly on their guard. By now they were ripe for the plucking. Washington told his assembled officers at headquarters to prepare for a multipronged attack across the Delaware River on Christmas night - approximately 4,600 men in total, with 2,400 under Washington. As the Continentals quietly celebrated Christmas morning and then prepared for the attack, the skies became leaden and overcast. A winter storm was brewing. The soldiers started marching before sunset, just as a fierce nor'easter brought in gusts of icy rain, followed by sleet and snow. "It will be a terrible night for the soldiers who have no shoes. Some of them have tied old rags around their feet; others are barefoot, but I have not heard a man complain," wrote an officer in his diary. Washington's troops began crossing by rowing in sixty-foot Durham freight boats, and perhaps flatboat ferries and scows. The river, clogged by ice and buffeted by wind, looked dangerous - but to prevent hesitation, Washington set a leader's example by stepping onto a flatboat ferry, guided by cable, and crowded with troops, cannons and horses, and sternly ordering the crew to take him across. On the other side he stepped ashore and stood resolutely on the bank to watch the other boats follow. The troops lit bonfires as they landed and fought to keep warm. At 4:00 a.m., Washington led the troops forward to change the course of history. His example inspired the men as they had never been inspired before. The attack on Trenton the morning of December 26 was swift and effective, and the entire German garrison was captured. More miracles followed in the coming days as Washington convinced most of his remaining soldiers to extend their enlistments past the New Year instead of returning home. He then led them on a brilliant campaign that resulted in another victory at the Battle of Princeton (January 3, 1777) and forced the British to abandon most of their gains in New Jersey. The course of the war and American history was forever changed. 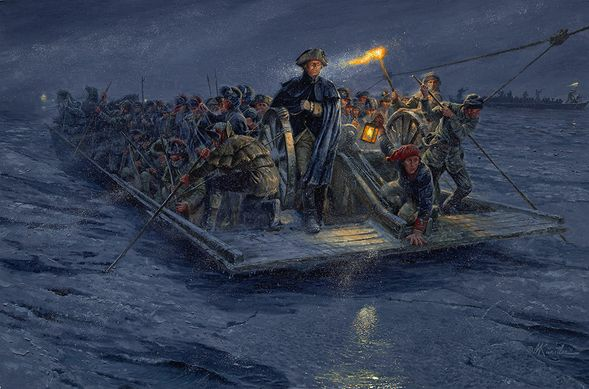 There are few images as enduring in American history as the one of General George Washington standing tall, next to the Stars and Stripes, in a rowboat gliding past mini-icebergs as he leads his troops across the Delaware River on Christmas Day 1776 to start a surprise attack on Hessian forces during the Battle of Trenton. In his 1851 portrait, "Washington Crossing the Delaware," among the best-known of American paintings, the artist, Emanuel Leutze, did not shy away from imbuing the scene with a dose of glory, inspiration and heroism. He also did not let the facts get in the way of his masterpiece - the original hangs at the Metropolitan Museum of Art. "The only thing wrong with this historical image is the history part," said Mort Künstler. "I'm not knocking the original: it's got great impact and Leutze did a heck of a job. I give Leutze higher marks for a good painting than for historical accuracy, buy why can't you have both?" Mr. Künstler, who has gained some renown for painstakingly researched paintings that strive for accuracy, invested two months of research for the new painting. And so, instead of the small, somewhat tipsy rowboat in Leutze's painting, Mr. Künstler depicts a 60-foot long flatboat ferry, guided by cable, and crowded with dozens of troops, and cannons and horses. Washington is not elevated, but rather nestled against a cannon wheel for support. He is buffeted by driving snow - records show the crossing happened during a northeaster - and his face is lit by lantern and torch against a night sky. The ferry cuts through thick layers of ice, which Mr. Künstler says corresponds with the photographs he obtained of the actual way the Delaware freezes. Leutze had limited access to historical material when he created the painting in Germany, where he was born. While Leutze painted a glowing sky and wide river, Mr. Künstler's painting is more in keeping with the records that this was a dead-of-night crossing at a section of the river less than 300 yards wide. As for the flag in the Leutze painting - the Stars and Stripes was not adopted until after the crossing - Mr. Künstler's version has no flag. Mr. Künstler's research for this painting included consulting historians and books, as well as journals about the crossing and weather records. He photographed the Delaware at the location - what is now called Washington Crossing - and researched the kinds of boats that were in use at the time. With an estimated 5,000 paintings and ink drawings under his belt, Mr. Künstler has long tried to let history dictate his paintings, putting in months of research for a portrait. He has weighed Custer's Last Stand and Theodore Roosevelt's charge up San Juan Hill. But, as Mr. Künstler said, "If I'm remembered for one painting, this will be it, simply because it is an iconic image."